Hydrogen can be produced by various process technologies. Firstly, hydrogen can be obtained from natural gas through a steam reforming process or a methane pyrolysis process. Secondly, hydrogen can also be produced by splitting water into hydrogen and oxygen via electrolysis (power-to-gas). Thirdly, hydrogen can be produced via gasification process, by converting solid fuel (coal or woody biomass) to hydrogen. Fourthly, hydrogen can also by produced through anaerobic digestion, converting wet biomass to hydrogen. At present, steam methane reforming is the most common method of producing hydrogen. 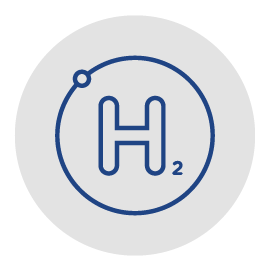 Hydrogen can be utilised directly as fuel or, depending on the application, blended with natural gas. Hydrogen production from RES-based electricity in power-to-gas facilities or from other fuels in combination with CCS contributes to the decarbonisation of the energy system. The aim of the HESTOR research and development project carried out by a scientific and industrial consortium was to investigate the possibility of hydrogen storage in salt caverns, generated from RES, and its further use for energy generation and technological purposes in oil & refinery industry. The Project also considered technical and economic aspects of the use of hydrogen as a fuel in transport. Read more about the other issues addressed in the document using the link below. FenHYx is a first demonstrator on a European scale to test hydrogen and decarbonised gases in the networks.The FenHYx platform in particular aims to reproduce the features of gas networks and especially those of the gas transmission networks: compression, expansion, measurement, analysis, injection loop, etc. The opening up of this platform to other operators will contribute to the emergence of the hydrogen sector. Ontras Gastransport GmbH, SNAM Rete Gas S.p.A.
Austrian Presidency of the EU Council started the “Linz Hydrogen Initiative” and invited to a high level conference on the eve of the Informal Meeting of the Energy Ministers on 17 September. The conference focused on the topics of renewable hydrogen, energy storage technologies and innovative energy technologies for energy intensive industries. RENOVAGAS is a research project whose first phase finished in 2017. It first aim was the development of a 15 kW demonstration plant for the production of synthetic natural gas (SNG) from the electrolytic production of hydrogen with renewable energy sources (RES) and its combination directly with a biogas stream, that is, without separating CO2 from the methane, through a methanation process, so the synthetic natural gas obtained was fully renewable. The Wind2Hydrogen pilot facility in Auersthal, Lower Austria was in operation from January 2014 until the end of 2017. It converted power from wind turbines into transportable, storable hydrogen using a new, specially developed electrolysis process that responds very quickly to changing loads from a wind farm, and can economically produce high pressure of around 165 bar. The hydrogen released from the Dow's factory is used as a feedstock for high-quality products of Yara through a existing Gasunie pipeline which has been prepared for hydrogen transport. This project focuses on the development of a disruptive photoelectrochemical cell that will be used as a reactor for the direct transformation of solar into chemical energy. Innovative materials and new structures are used achieving a remarkable efficiency. This promising technological route allows the competitive industrial production of clean and storable fuels directly from sunlight and water. The project started in September of 2018 and will last for 2 years. The main partners leading the project are Repsol and Enagas. National Grid are partnering with the Health & Safety Executive to undertake a technical evaluation of the capability of the UK’s National Transmission System (NTS) to transport hydrogen. This project will run up to Spring 2019 and will generate a deeper understanding of how introducing hydrogen will affect gas transmission assets physically; and of the standards required to facilitate hydrogen introduction. The project will also use the findings to evaluate potential UK sites which could demonstrate hydrogen introduction at scale, further advancing the UK’s green energy ambitions. M/R Helle is a demonstration project to test and evaluate the consequences of hydrogen/natural gas mixtures in the gas infrastructure. Mixtures of hydrogen and natural gas will be circulated for two years. The purpose of the project is to find the constraints and to prepare for a possible future handling hydrogen/natural gas in the gas grid. Ervia, the parent company of Gas Networks Ireland, commissioned KPMG to develop and evaluate a number of scenarios for the decarbonisation of the one million Irish residential homes currently connected, or within close proximity, to the existing gas network.